Video by 33 Studio, WeFilmPhilly Cai Guo-Qiang: Fireflies (2017). Photo Jeff Fusco Photography © 2017 for the Association for Public Art. Please note that Cai Guo-Qiang: Fireflies is no longer on view. Thank you to all of our partners and everyone who supported this project! 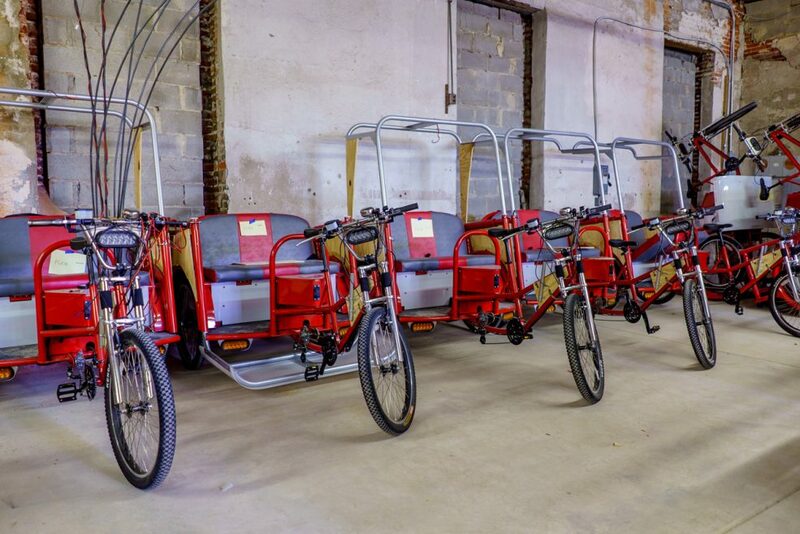 Free public rides in the pedicabs began September 15th with one-way trips from Iroquois Park to Sister Cities Park and vice versa. Walk-ups were welcome and reservations could be made online. 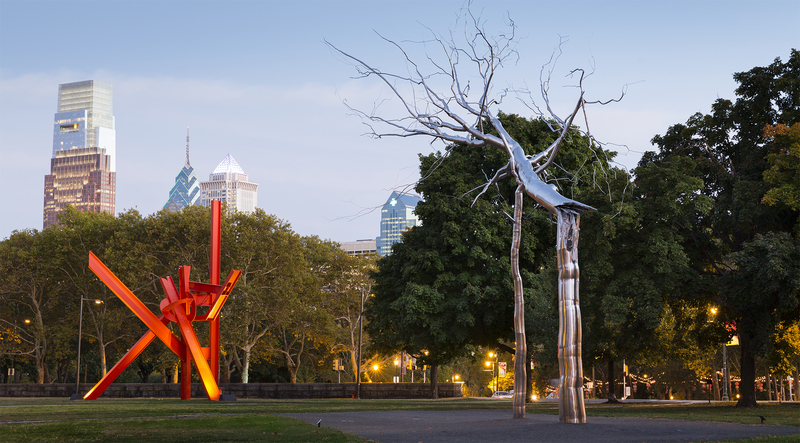 In September 2017, the Association for Public Art (aPA) in Philadelphia presented a major new site-specific work by the internationally acclaimed artist Cai Guo-Qiang. 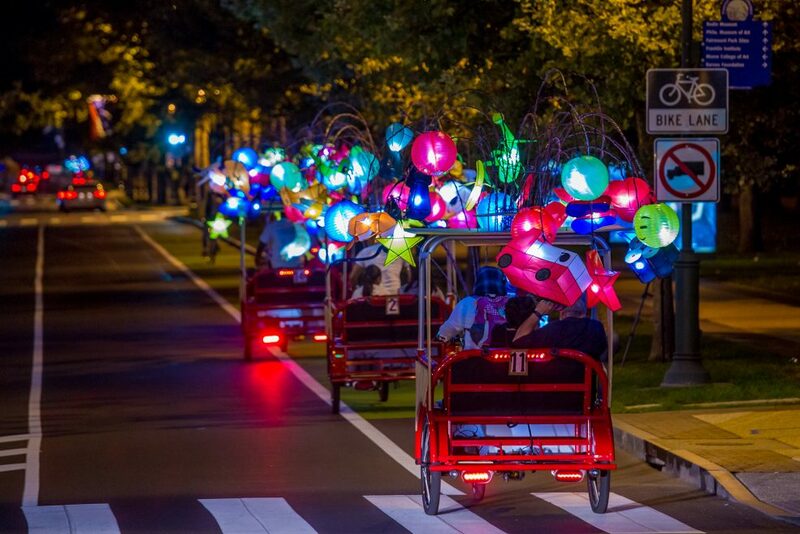 Commissioned by aPA with Fung Collaboratives on the occasion of the centennial of the Benjamin Franklin Parkway, Cai Guo-Qiang: Fireflies invited the public to actively experience the grand boulevard as a nocturnal dreamscape conjured from the languorous movements of bobbing clusters of glowing handcrafted Chinese lanterns and groups of customized peddle vehicles. 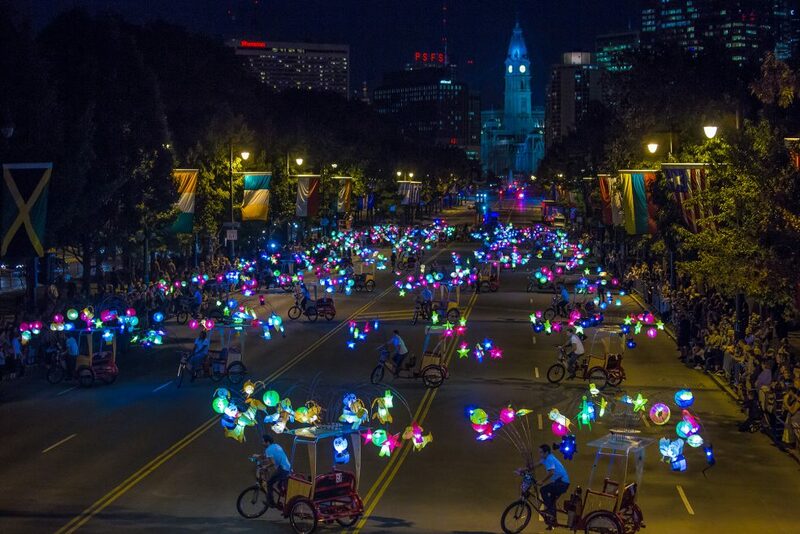 Nine hundred illuminated lanterns in a bevy of colors and shapes floated along the Benjamin Franklin Parkway, held aloft by a fleet of 27 pedicabs. 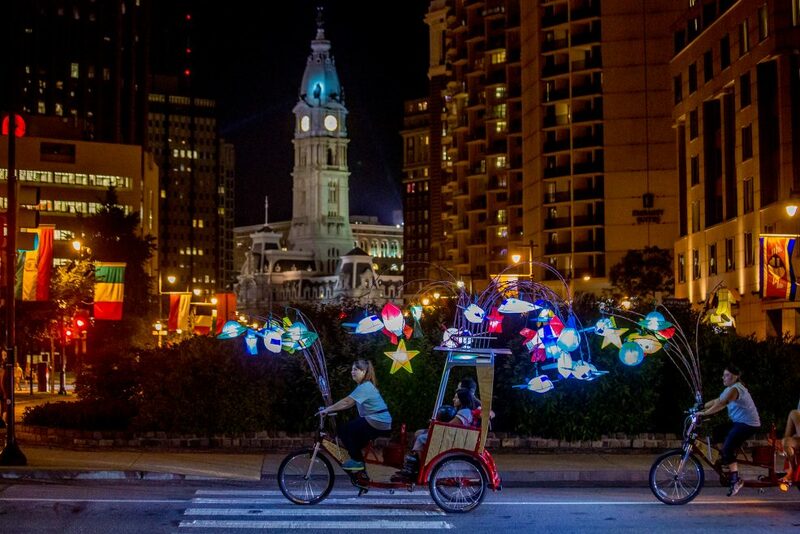 Cai Guo-Qiang: Fireflies public rides on the Benjamin Franklin Parkway. Photo Jeff Fusco Photography © 2017. 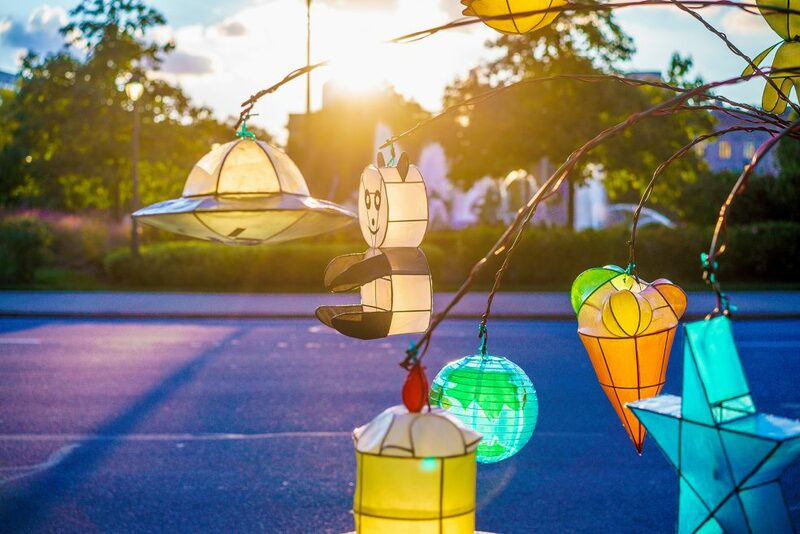 Fireflies, the artist’s largest public art project in the US in a decade, ran for approximately four weekends: September 14 to October 8, 2017, Thursdays through Sundays from 6-10pm. 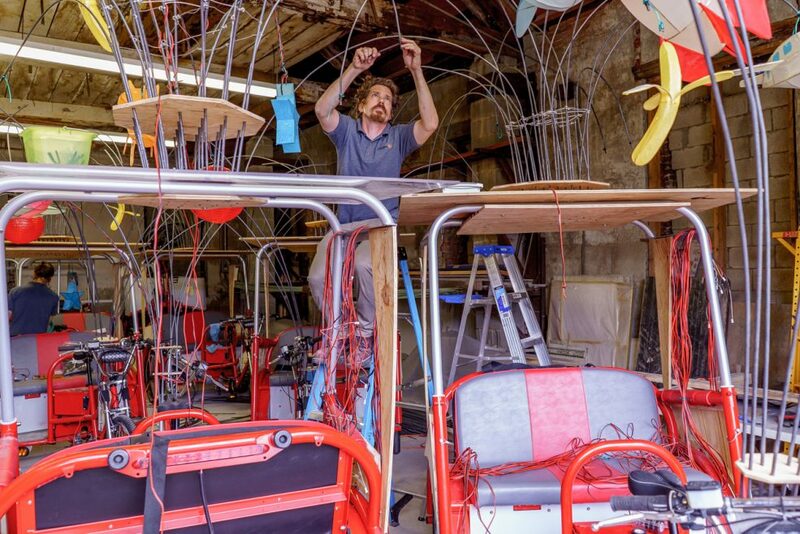 Beginning September 15, members of the public were invited to board the vehicles to take rides up and down the Parkway from Sister Cities Park at Logan Square to Iroquois Park across from Eakins Oval. 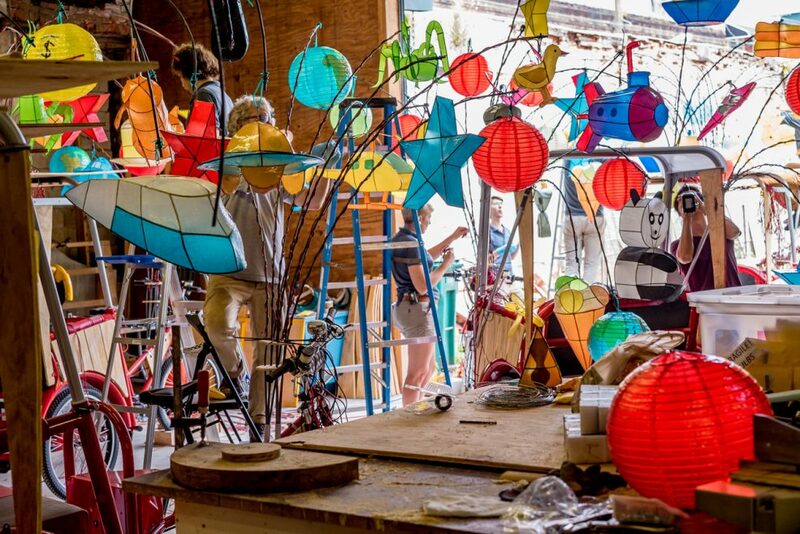 The Fireflies lanterns were handcrafted in Cai Guo-Qiang’s hometown of Quanzhou, China. 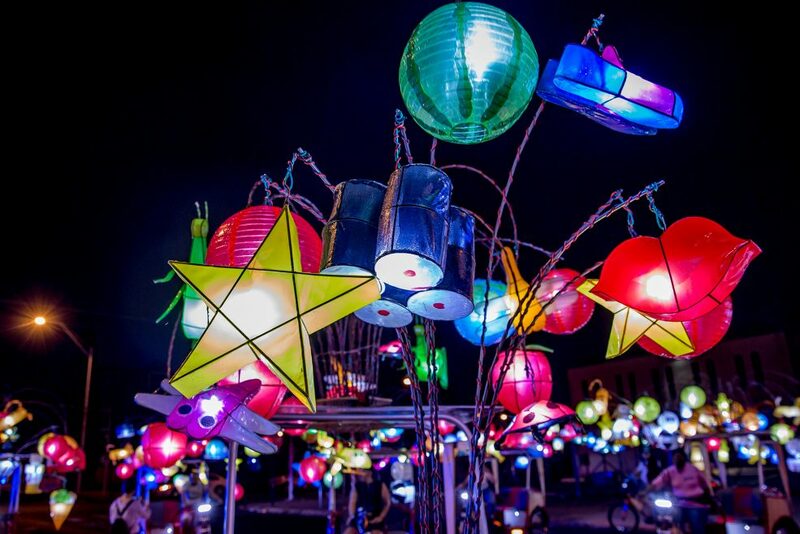 Their bright, twinkling lights evoked the artist’s own childhood memories. 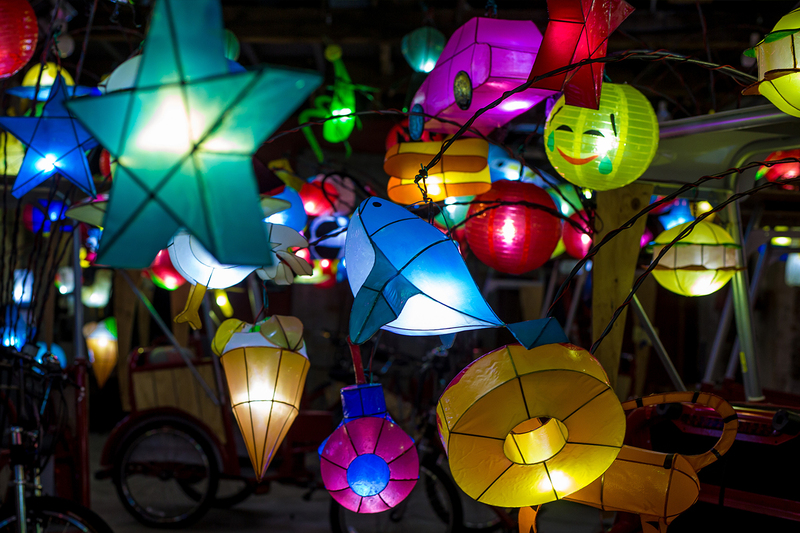 Among them were orb and star shaped lanterns, as well as designs of emojis; pandas, roosters and tigers; space aliens and UFOs; cars, trains, boats, submarines, helicopters, and rocket ships; and hamburgers, sushi, and donuts. 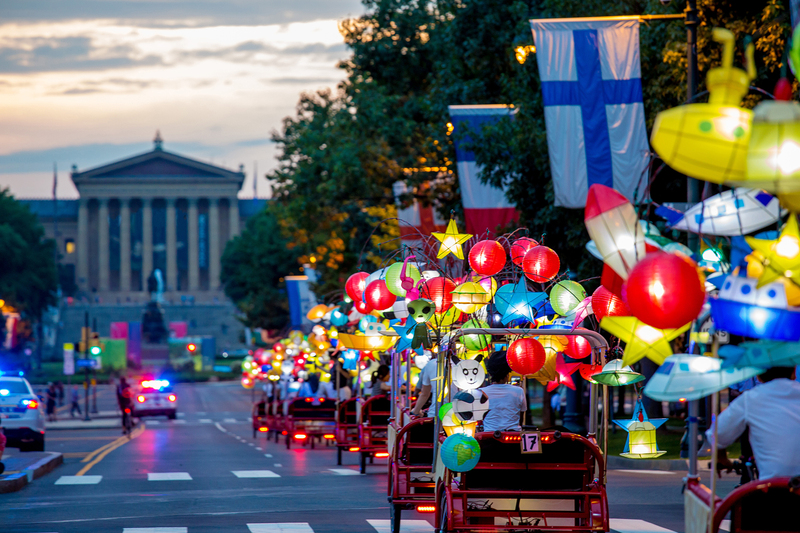 Transported to Philadelphia, their various colors and shapes evoked the diverse cultures and peoples that come from all over the world to take root in the US. Major support for Cai Guo-Qiang: Fireflies was provided by The Pew Center for Arts & Heritage. Voices heard: CAI GUO-QIANG (the artist who created Fireflies) is famous for his virtuosic and poetic use of fireworks and gunpowder. For more than 25 years, Cai Guo-Qiang’s practice has spanned a range of media in contemporary art, including drawing, installation, video, and performance art, as well as a range of Chinese traditions in medicine, art, and place making. PENNY BALKIN BACH is Executive Director & Chief Curator of the Association for Public Art (aPA) and the author of many books and articles about public art in Philadelphia. LANCE FUNG is Chief Curator of Fung Collaboratives, conceiving and realizing art exhibitions around the world. 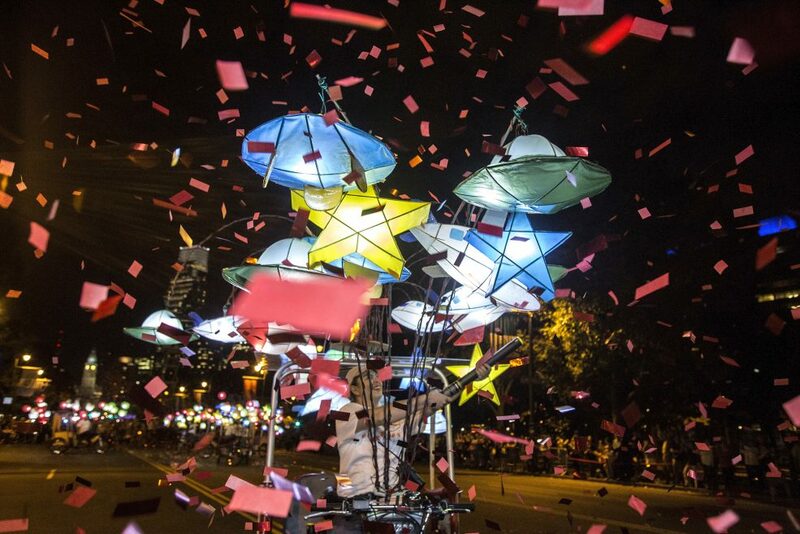 The aPA commissioned Fireflies in collaboration with Fung Collaboratives. Segment Producer: Anne Hoffman. Cai Guo-Qiang: Fireflies. Photo Jeff Fusco Photography © 2017. Cai Guo-Qiang: Fireflies opening celebration on the Parkway. Photo Jeff Fusco Photography © 2017. Cai Guo-Qiang: Fireflies opening celebration on the Parkway. Photo Meredith Edlow © 2017. Cai Guo-Qiang: Fireflies on the Parkway. Photo Jeff Fusco Photography © 2017. View from Assembly rooftop. Photo by Jeff Fusco Photography. 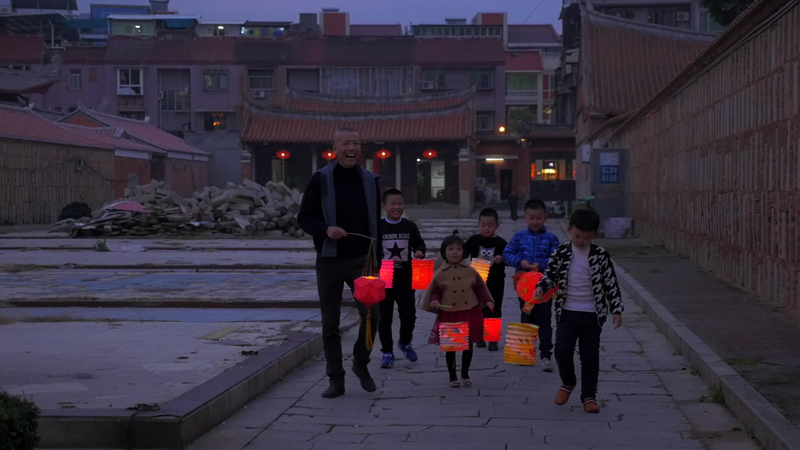 Cai Guo-Qiang with children and lanterns in Quanzhou, China. Photo courtesy Cai Studio. For more than 25 years, Cai Guo-Qiang’s practice has spanned a range of media in contemporary art, including drawing, installation, video, and performance art, as well as a range of Chinese traditions in medicine, art, and place making. The artist is famous for his virtuosic and poetic use of fireworks and gunpowder and has been honored with many awards, including the 48th Venice Biennale International Golden Lion Prize in 1999, the 2013 U.S. Department of State’s Medal of Arts, and the Praemium Imperiale in 2012. In 2016, Netflix released Sky Ladder, a 1 hour and 44 minute film documenting one of Cai Guo-Qiang’s most celebrated public projects. 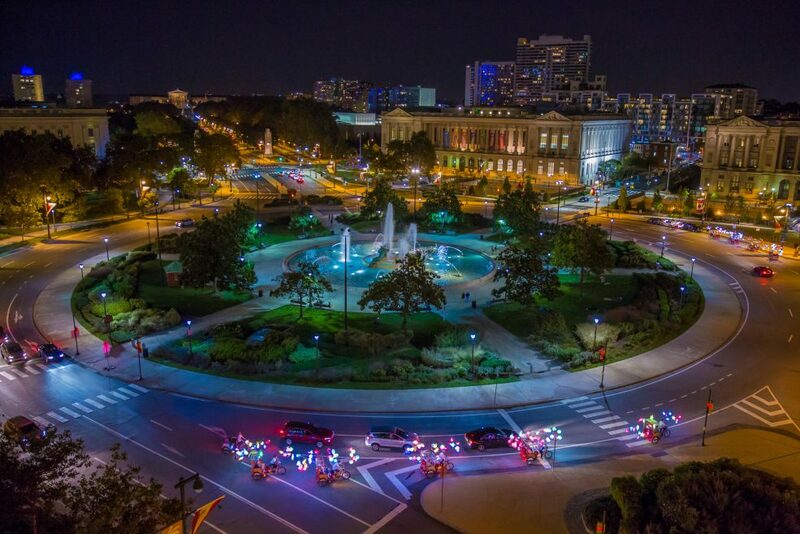 Thank you to everyone who joined us for the opening celebration on the Benjamin Franklin Parkway! 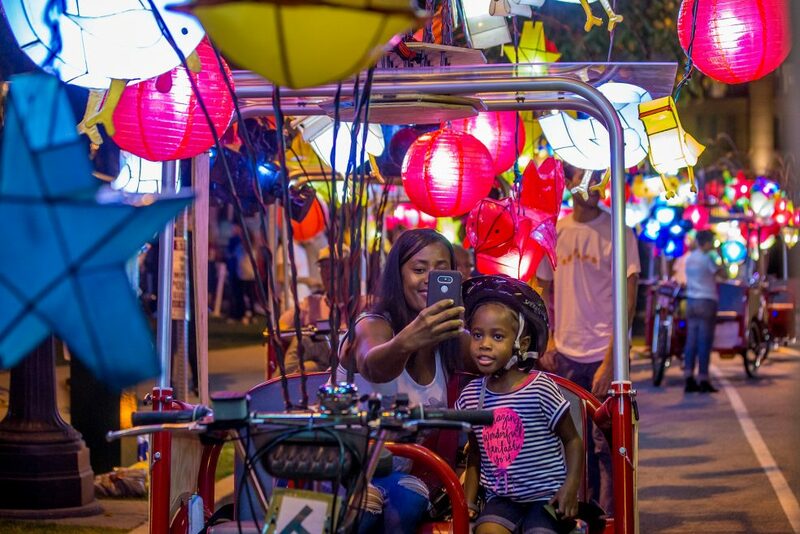 The public take free rides in the “fireflies” through October 8, 2017, Thursdays – Sundays from 6-10pm. 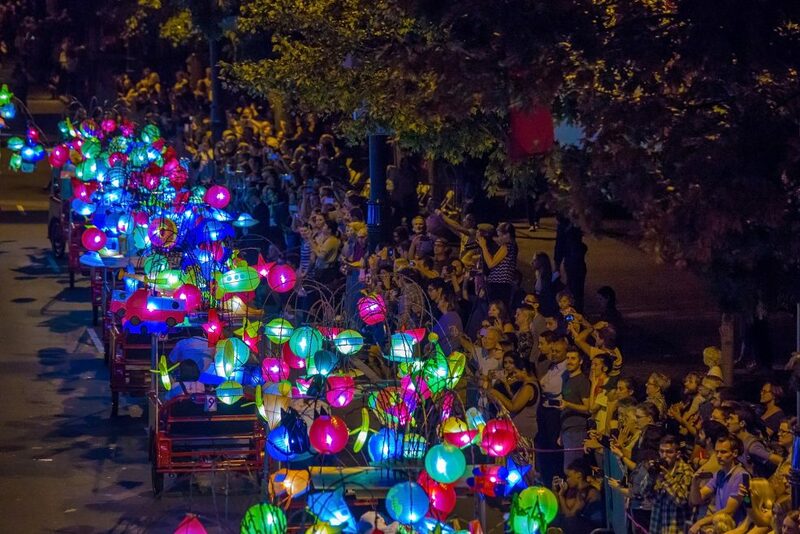 A free public celebration kicked off Fireflies on Thursday, September 14, featuring a one-time-only public performance directed by Cai Guo-Qiang. 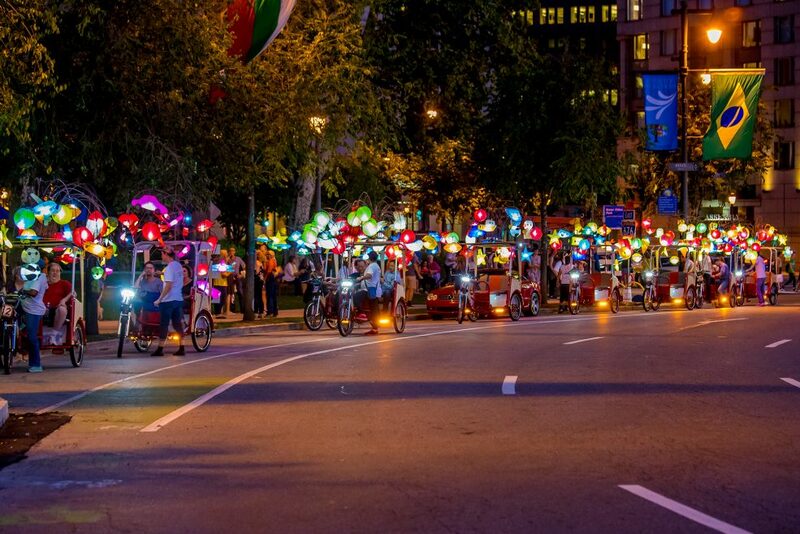 The artist orchestrated a dream-like light and movement performance with the Fireflies pedicabs, creating luminous choreography on the Parkway. 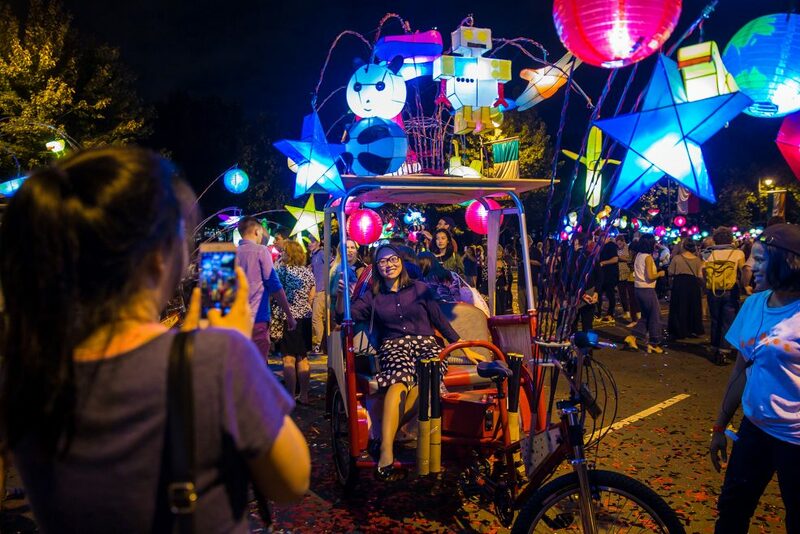 Attendees were invited to observe the delicate aerial dance of the pedicabs and their lanterns along the roadway performance space, between 22nd Street and Eakins Oval on the Benjamin Franklin Parkway. Starting at 6:30pm, the Yards Brewing Company Pop-Up Beer Garden was available to guests ages 21 years and older. Food trucks included The Cow and the Curd, My Four Suns, Creme Brulee, and Tasty Eats. Click below to make a gift today! 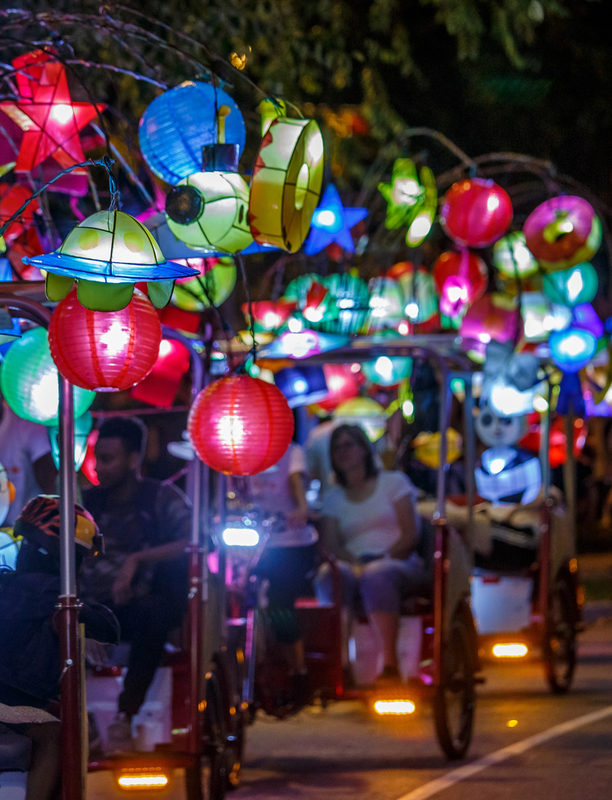 Enjoy FREE Fireflies pedicab rides and watch the glowing vehicles move along the Parkway from September 15 – October 8, 2017, Thursdays through Sundays from 6-10pm. 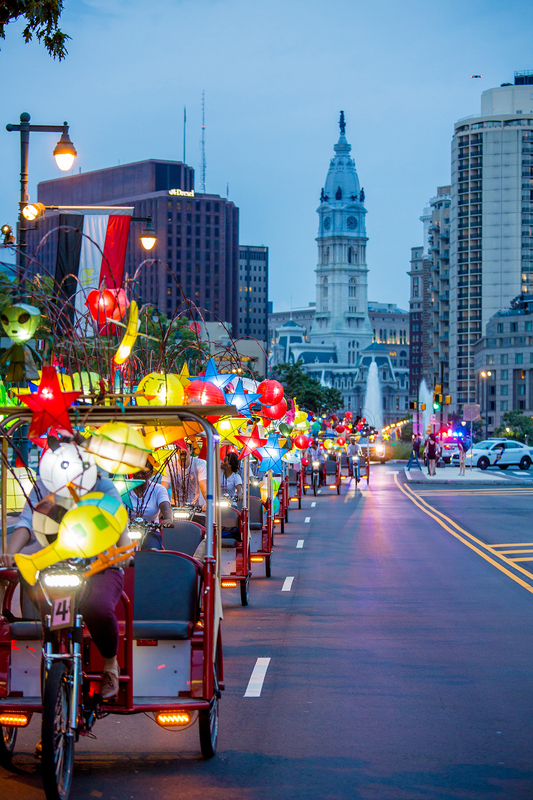 These are ONE-WAY rides for up to two people on the Benjamin Franklin Parkway from Iroquois Park to Sister Cities Park or vice versa. The vehicles can accommodate up to two passengers, and each trip takes approximately 15 minutes. Walk-ups are welcome, but online reservations can be made below. Is the night that you’re wanting to reserve a ride sold out? One “Hub” will be at Iroquois Park (above). Photo James Ewing Photography © 2014. The other “Hub” will be at Sister Cities Park (above). Photo Todd Mason Halkin, courtesy Center City District. 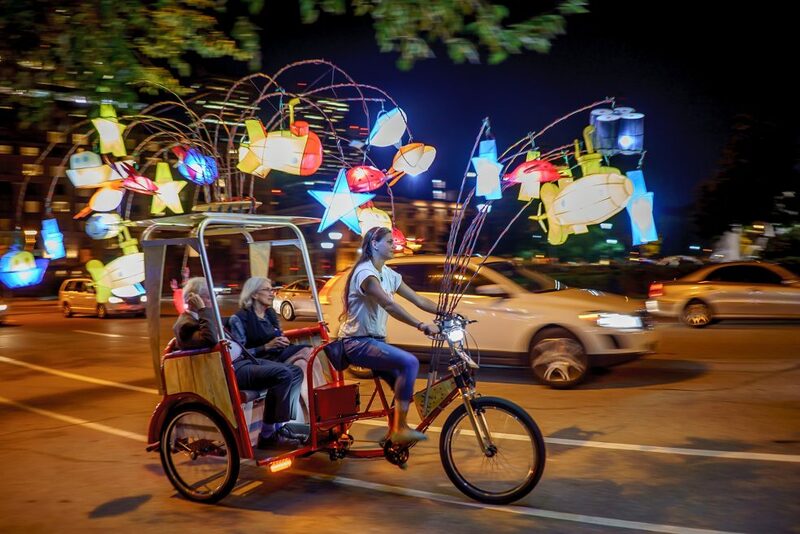 Head to the two Fireflies “Project Hubs” (headquarters) on the Parkway – one at Iroquois Park and the other at Sister Cities Park – to board the pedicabs and watch the Fireflies glide by. Some seating will be available at these “outdoor living rooms,” and picnicking is welcomed! There will be nearly-nightly food trucks at Iroquois Park, and The Logan Cafe at Sister Cities Park will have extended hours. 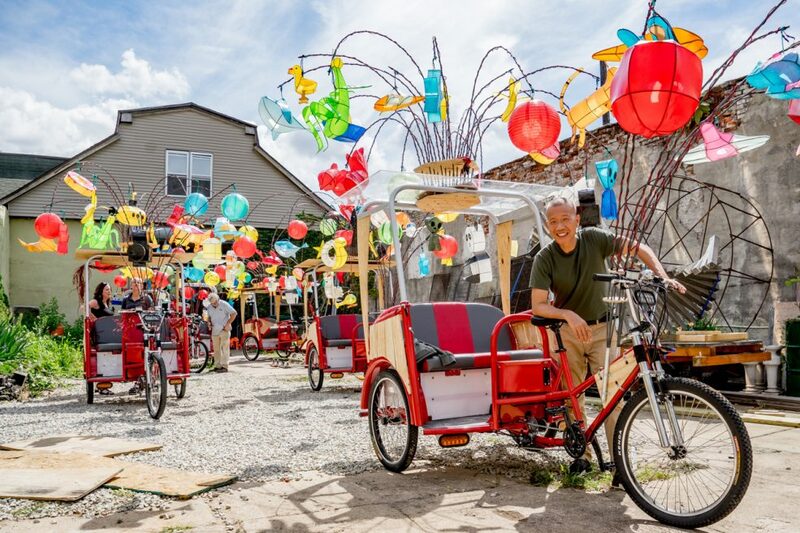 A new film about artist Cai Guo-Qiang and Fireflies will also be playing at both locations. Check this page or aPA’s Twitter feed for updates! 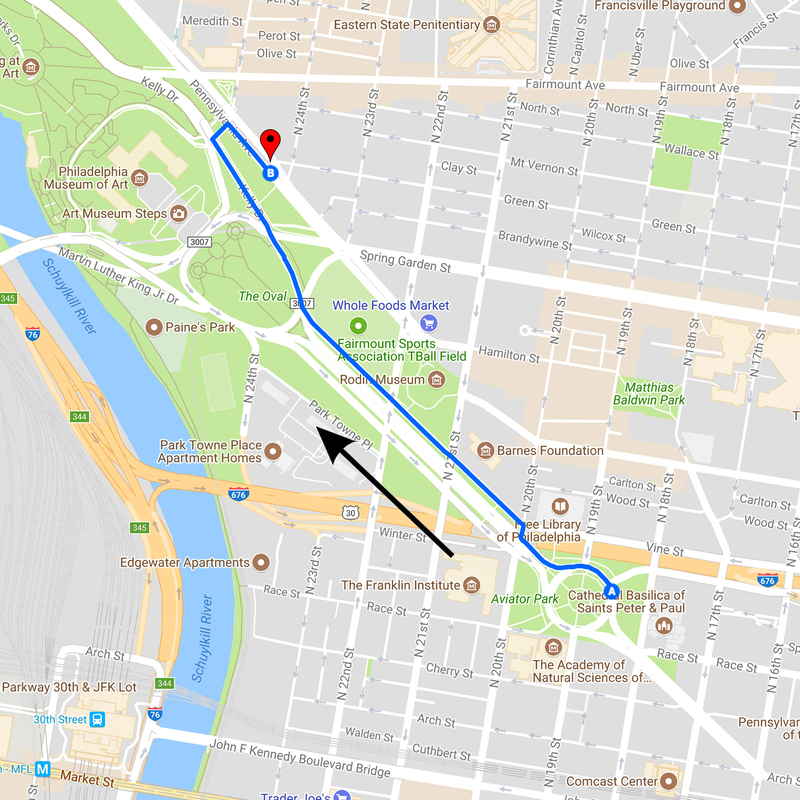 This route BEGINS AT IROQUOIS PARK, located at 24th Street and Pennsylvania Avenue near the Philadelphia Museum of Art, and ENDS AT SISTER CITIES PARK, located at 18th Street and the Benjamin Franklin Parkway at Logan Square. Please board at Iroquois Park. This is a free ONE-WAY ride for up to two people, weather permitting. The route is approximately one mile and takes about 15 minutes. Walk-ups are welcome, even on nights that reservations are full! 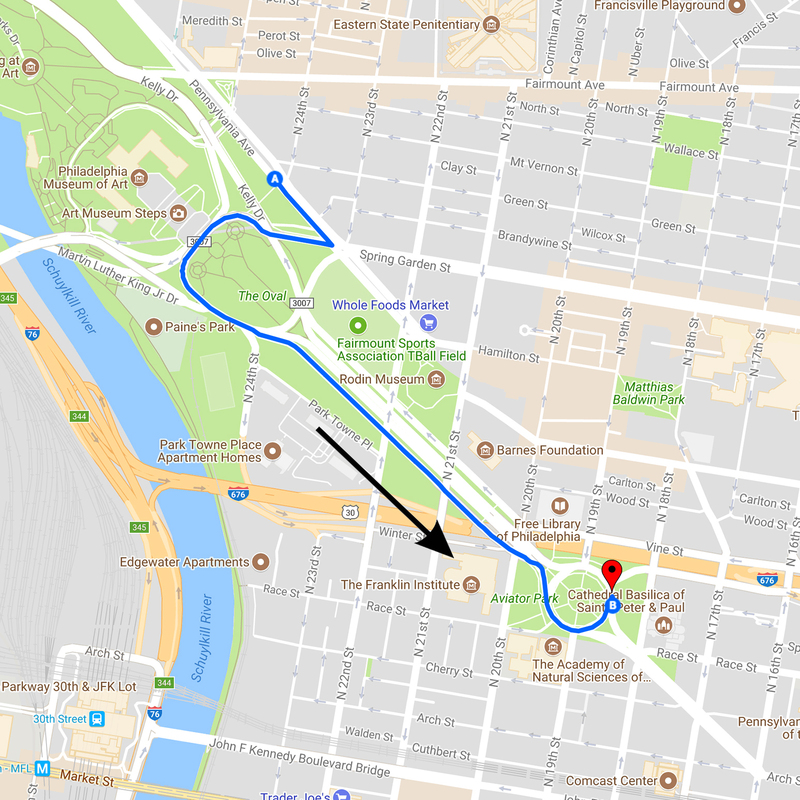 This route BEGINS AT SISTER CITIES PARK, located at 18th Street and the Benjamin Franklin Parkway at Logan Square, and ENDS AT IROQUOIS PARK, located at 24th Street and Pennsylvania Avenue near the Philadelphia Museum of Art. Please board at Sister Cities Park. If the ride you want is sold out, check back in case other people cancel. And walk-ups will be welcomed even if reservations are full! 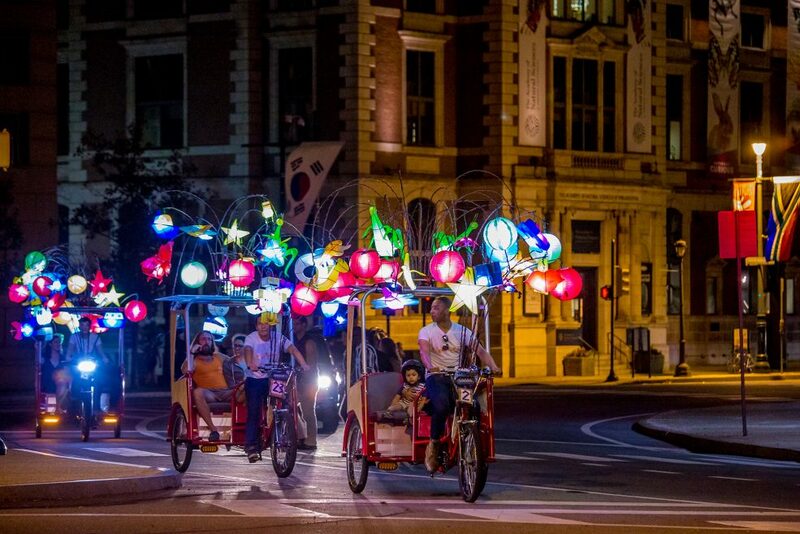 ALL​ ​PARTICIPANTS​ ​RIDE​ ​IN​ ​A​ ​FIREFLIES​ ​PEDICAB​ ​AT​ ​THEIR​ ​OWN​ ​RISK. Riders​ ​under​ ​18​ ​years​ ​must​ ​be​ ​accompanied​ ​by​ ​an​ ​adult. Children​ ​under​ ​12​ ​years​ ​must​ ​wear​ ​a​ ​helmet​ ​(PA​ ​vehicle​ ​code,​ ​75​ ​Pa.C.S.​ ​§3510). The aPA will follow Pennsylvania Vehicle Code, 75 Pa.C.S. § 3510, which requires that all​ ​children​ ​under12​ ​wear​ ​a​ ​helmet​ ​while​ ​riding​ ​in​ ​a​ ​pedalcycle​ ​vehicle​. We advise parents of children under 12 if inpossession of a helmet for their child to bring it with them for their reserved or walk-up ride on Fireflies. Forthose that do not have personal helmets for their children, we will have a limited number of youth helmetsavailable at each project hub location. The availability of these helmets however, may increase wait times.Adults​ ​are​ ​not​ ​required​ ​to​ ​wear​ ​a​ ​helmet. Only​ ​children​ ​under​ ​2​ ​years​ ​should​ ​be​ ​on​ ​an​ ​adult’s​ ​lap. NO​ ​animals​ ​(except​ ​harnessed​ ​service​ ​dogs). NO​ ​smoking,​ ​food,​ ​or​ ​drink​ ​inside​ ​the​ ​pedicab. 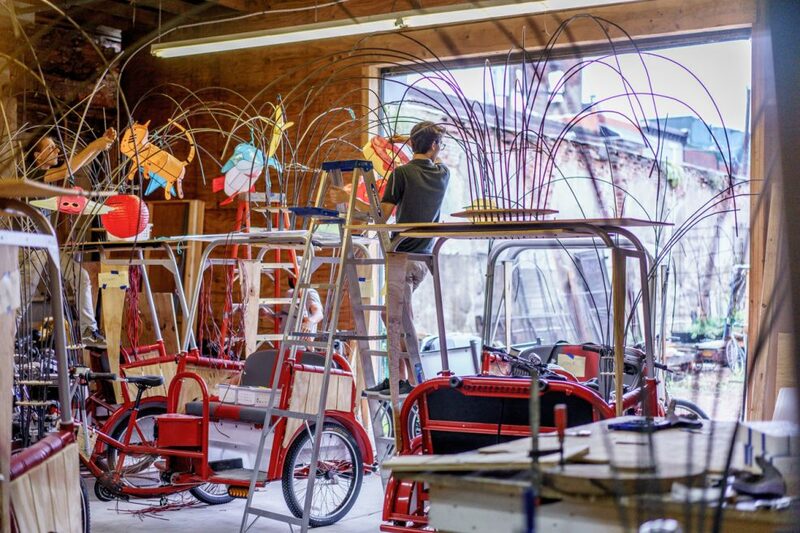 NO​ ​standing​ ​in​ ​the​ ​pedicab. 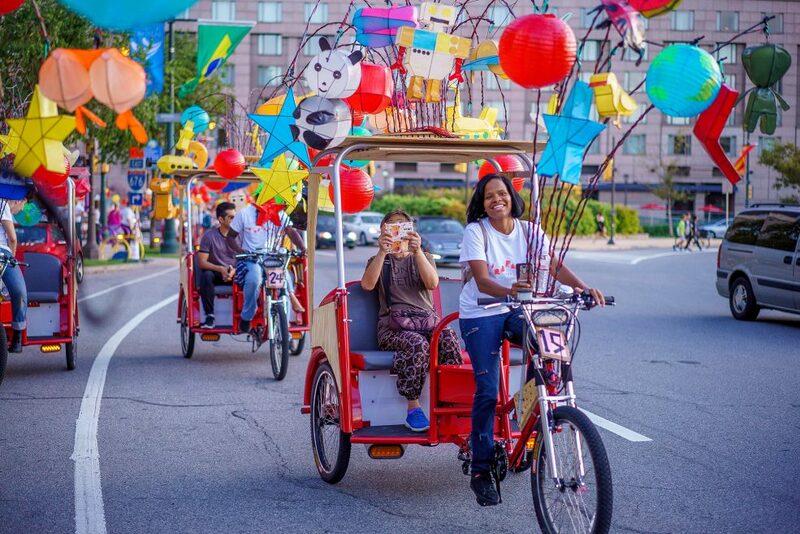 Keep​ ​all​ ​hands,​ ​arms,​ ​feet,​ ​and​ ​legs​ ​in​ ​the​ ​pedicab​ ​at​ ​all​ ​times. 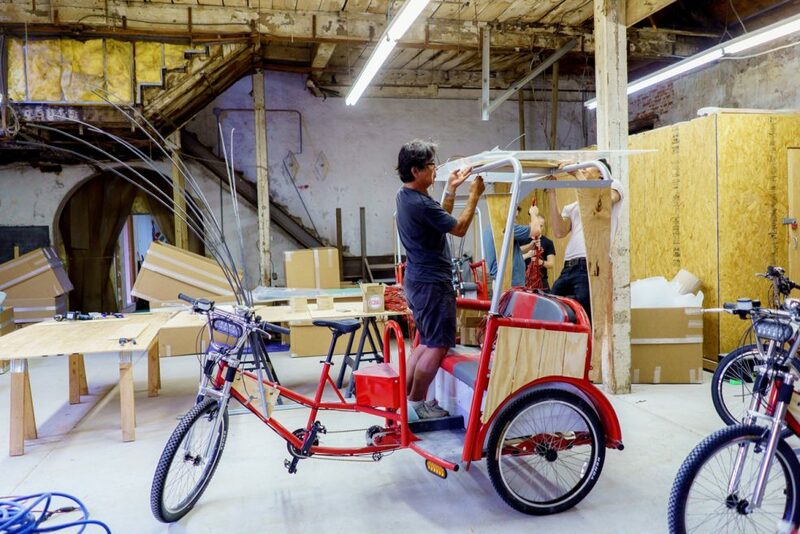 Remain​ ​in​ ​the​ ​pedicab​ ​until​ ​it​ ​comes​ ​to​ ​a​ ​complete​ ​stop​ ​at​ ​the​ ​unloading​ ​point. 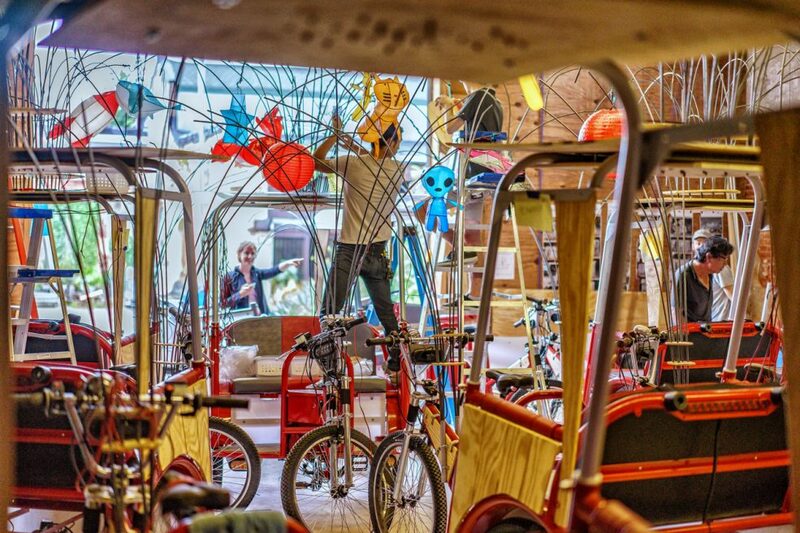 Please​ ​follow​ ​all​ ​instructions​ ​from​ ​the​ ​pedicab​ ​operator. Tipping​ ​the​ ​operator​ ​is​ ​not​ ​necessary. 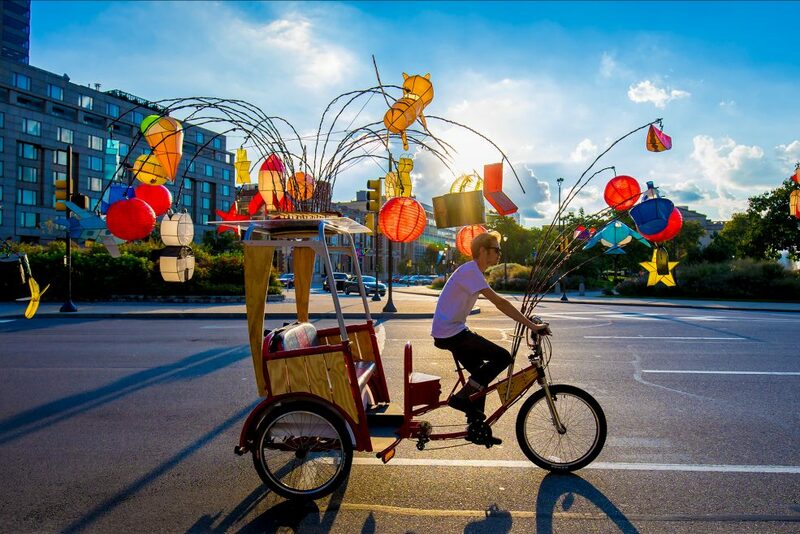 Fireflies​ ​pedicabs​ ​are​ ​artworks;​ ​please​ ​do​ ​not​ ​touch​ ​the​ ​lanterns. Rides​ ​are​ ​weather​ ​permitting​ ​and​ ​will​ ​not​ ​operate​ ​in​ ​inclement​ ​weather. aPA​ ​and​ ​its​ ​affiliates​ ​are​ ​not​ ​responsible​ ​for​ ​the​ ​loss​ ​of​ ​any​ ​personal​ ​belongings. Passengers​ ​must​ ​practice​ ​common​ ​courtesy​ ​and​ ​appropriate​ ​behavior. Pedicab​ ​operators​ ​reserve​ ​the​ ​right​ ​to​ ​remove​ ​any​ ​rider​ ​in​ ​violation​ ​of​ ​these​ ​rules. 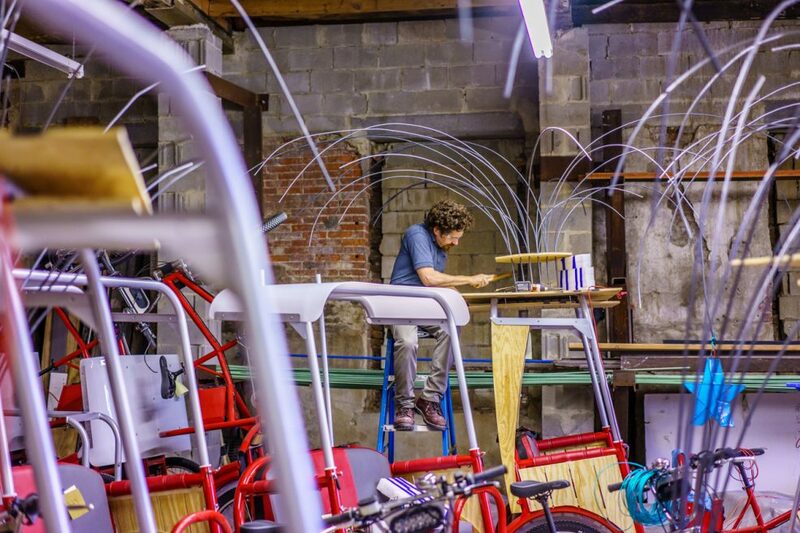 Indego is Philadelphia’s official bike share program and great way to get around town. See a map of all Indego bike stations or download the app. Use your credit card at any station to buy a single trip at $4 per half-hour. 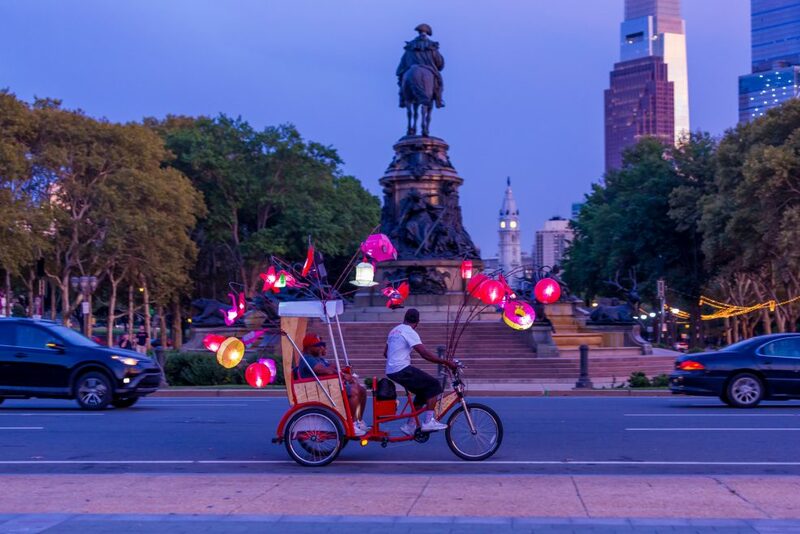 Philly PHLASH Downtown Loop™ is the quick and easy way to visit many of Philly’s historic attractions and cultural institutions, including those on the Parkway. The cost is $2 per person per ride or $5 for an all-day pass, and children 4 and under and seniors ride for free. 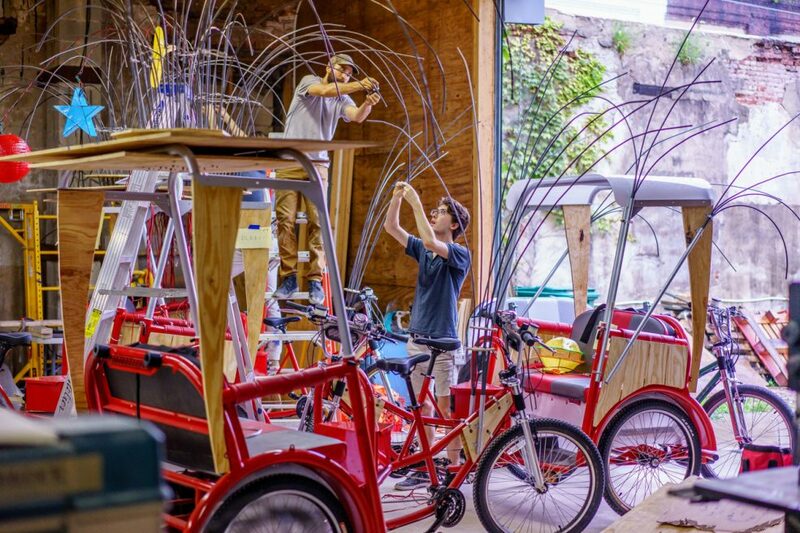 The PHLASH operates Friday-Sunday 10AM-6PM during Fireflies. 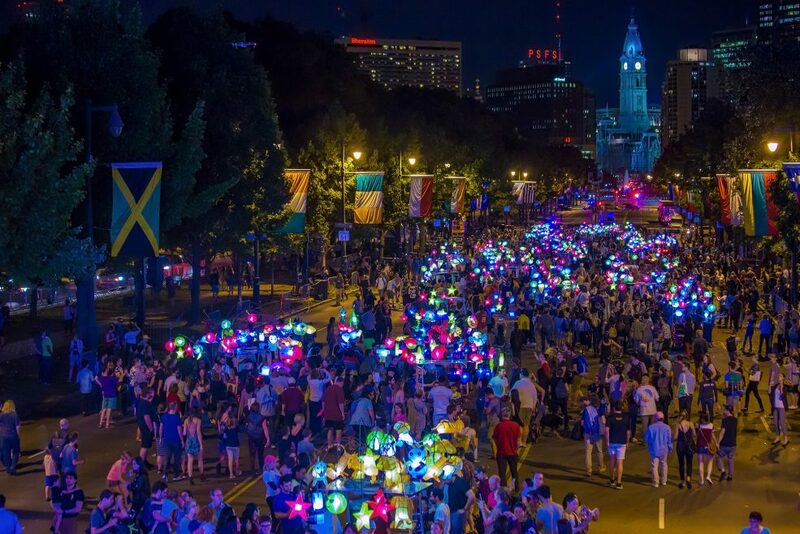 There are plenty of great places to watch the Fireflies traverse the Parkway, and many fantastic events happening nearby, including Opera Philadelphia’s Festival, Friday Nights at the Philadelphia Museum of Art, The Franklin Institute’s Terracotta Warriors exhibit, Philadelphia’s Fringe Festival, and Parkway 100 events. See below for our recommendations! Get the Parks on Tap perspective! Parks on Tap at Shakespeare Park (on the Parkway) is the official beer garden of Fireflies. Come for fresh food, beer on tap, wine, snacks, and non-alcoholic beverages in a festive outdoor environment featuring comfortable seating, clean restrooms and a variety of family-friendly activities. A portion of the proceeds benefits Philadelphia’s parks! 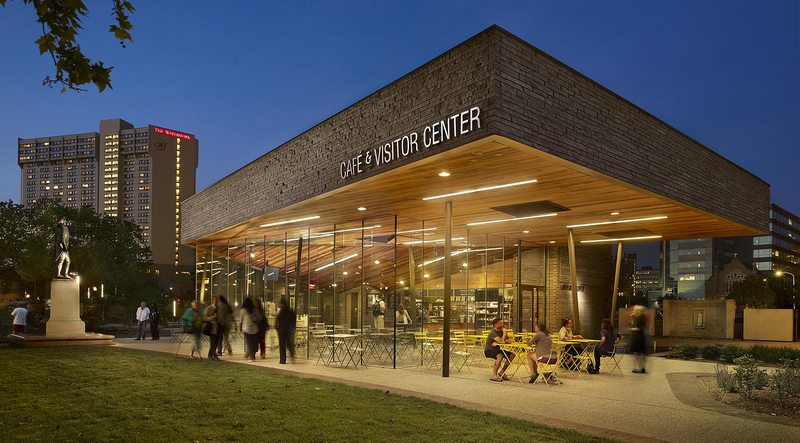 Open Thursdays through Sundays, September 15 – October 8, 5-10PM. 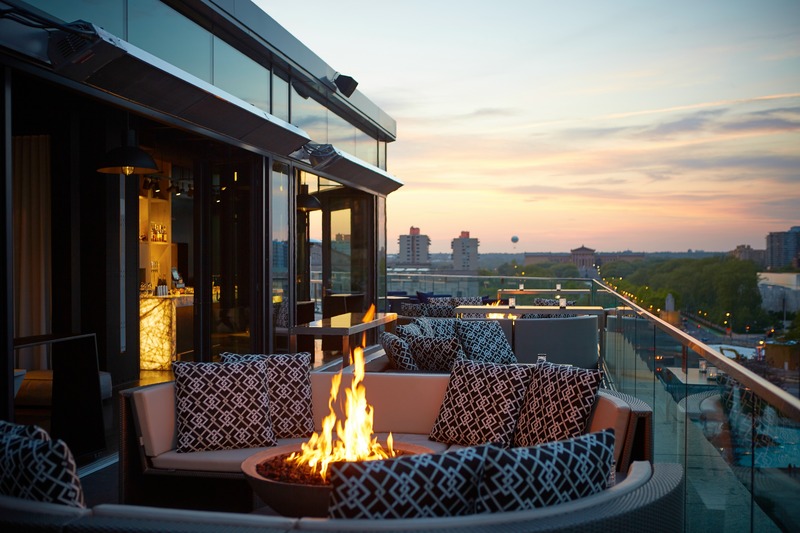 The Logan’s Assembly Rooftop Lounge, which overlooks the Parkway. Photo courtesy The Logan. A chic art-inspired hotel right on the Benjamin Franklin Parkway, The Logan, Philadelphia’s Hotel is the official hotel of Cai Guo-Qiang: Fireflies. Conveniently located across from Sister Cities Park, The Logan offers incredible views of the Parkway and Logan Square (see Swann Memorial Fountain). Guests can enjoy the hotel’s curated local art collection, its Assembly Rooftop Lounge and Urban Farmer steakhouse, and the many cultural institutions within walking distance, including the Philadelphia Museum of Art, The Franklin Institute, and The Barnes Foundation. See a list of offers and special packages for The Logan Hotel. 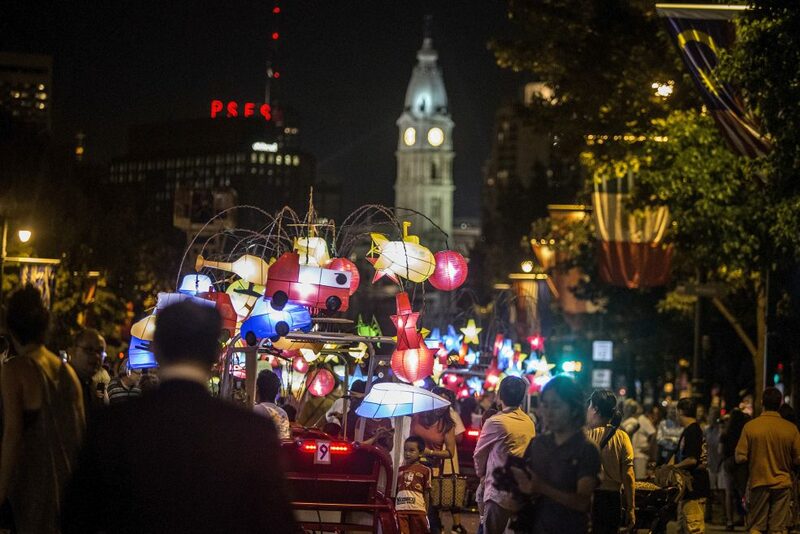 For deals on other hotels in the area, check out The Visit Philly Overnight Hotel Package. Participating hotels nearby include The Windsor Suites, Embassy Suites, and Sheraton Downtown Philadelphia. Major support for Cai Guo-Qiang: Fireflies has been provided by The Pew Center for Arts & Heritage, with additional support from the Association for Public Art (aPA), John S. and James L. Knight Foundation, National Endowment for the Arts, the Pennsylvania Council on the Arts, The Philadelphia Cultural Fund, Barbara B. and Theodore R. Aronson, Prudent Management Associates, Independence Foundation, the Hess Foundation, Glenmede, Cloud Gehshan, and individual donors. In-kind support provided by Tierney; Pennsylvania Convention Center; Expert Events; Park Towne Place Museum District Residences; The Logan, Philadelphia’s Hotel; China Partnership of Greater Philadelphia; Materials Conservation; Sang Kee Peking Duck House; Take One Production; Yards Brewing Co.; Clear Channel; and media sponsor WHYY. 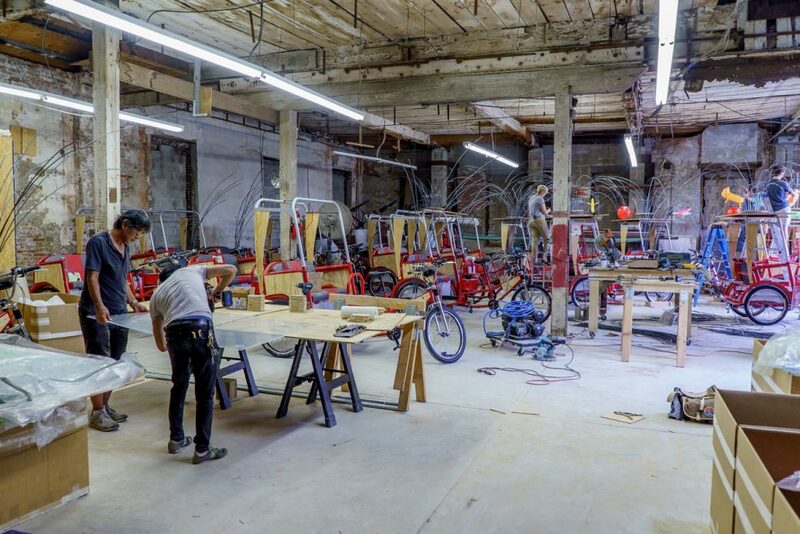 Our partners include: Velo-Park; Philadelphia Parks & Recreation; Philadelphia Streets Department; the Mayor’s Office of Arts, Culture and the Creative Economy; Center City District; Visit Philadelphia; The Parkway Council; (as of September 2017). As chief curator of Fung Collaboratives, Lance Fung conceives and realizes art exhibitions around the world. These include The Snow Show (2003-2006), wherein he partnered artists with architects to realize structures made primarily from snow and ice; Lucky Number Seven, the seventh SITE Santa Fe International Biennial, for which he assembled 26 artists from outside the US to create site-specific installations; and Artlantic (2012-2014), which transformed vacant lots in Atlantic City via “giant living sculptures.” Currently he is organizing Migrations for the Association of Bay Area Governments (ABAG) to bring ephemeral, temporary and permanent artworks along and within the Bay Trails.